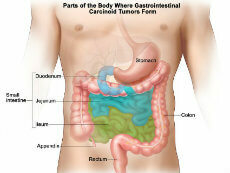 The appendix is located at the end of the large intestine. The largest-ever study of DNA changes in cancer of the appendix shows that this rare cancer is distinct from colorectal cancer and other cancers of the gastrointestinal (GI) system. Moreover, the study authors reported that specific genetic mutations found in the tumors may help predict whether they are likely to be aggressive. When cancer of the appendix cannot be removed completely with surgery, the standard treatment is to give patients the same chemotherapy regimens used to treat colorectal cancer. But recent studies analyzing the molecular characteristics of appendiceal cancers have suggested that approaching them as if they are the same as other GI cancers may be a mistake. The new study confirms that appendix cancer is “very different from colon cancer,” said John Paul Shen, M.D., one of the leaders of the study and a postdoctoral fellow at the University of California, San Diego (UCSD). The study was published online on August 8 in JCO Precision Oncology. The new study analyzed the DNA sequences of more than 300 cancer-associated genes in appendix tumor tissue from 703 patients using a test developed by the company Foundation Medicine. Last November, the Food and Drug Administration approved the Foundation Medicine gene panel as one of the first comprehensive genome-profiling tests for tumors. The frequency of mutations in important cancer genes clearly differed in the appendiceal cancers compared with colorectal and pancreatic cancers analyzed in earlier studies, Dr. Shen and his colleagues reported. For example, the TP53 and APC genes were far less likely to be mutated in appendiceal cancers than in colorectal cancer. Mutation frequencies also differed among appendiceal cancer subtypes (as defined by their appearance, or histopathology). For example, mutations in the KRAS gene were common in adenocarcinomas, which begin in the lining of the appendix, but were much less frequent in a subtype known as goblet cell carcinoids. One of the most striking findings was the difference in prognosis for patients whose tumors had mutations in the GNAS gene compared with patients whose tumors had mutations in the TP53 gene. In a group of 76 patients who were treated at UCSD, those with GNAS mutations had a life expectancy of 10 years after diagnosis, whereas patients with TP53 mutations had a life expectancy of 3 years. Patients whose tumors had neither mutation had a life expectancy of 6 years. In addition, GNAS mutations were almost never found in tumors that grow and spread quickly (high-grade tumors). The authors noted that this finding suggests that low-grade tumors with GNAS mutations don’t develop into high-grade tumors. By contrast, TP53 mutations were associated with poorer outcomes regardless of tumor grade. Carmen Allegra, M.D., head of GI Cancer Therapeutics in NCI’s Cancer Therapy Evaluation Program, commented that it is “of great value to have this sort of information” for a cancer that is relatively rare and not well understood. This kind of work can drive more research and the search for “specific and better” treatments, Dr. Allegra said. To develop more effective treatments for appendiceal cancer, Dr. Shen suggested that researchers may need to begin classifying these cancers by molecular type, rather than considering all appendix tumors as a single cancer type or a type of colorectal cancer. The addition of molecular typing may also serve as way to simplify tumor classification, Dr. Shen said. A 2017 study showed that pathologists give conflicting classifications for appendix cancer tumors nearly 30% of the time. While the study provides evidence that analyzing fewer than 10 genes can be very informative in classifying an appendiceal tumor, the study didn’t unearth “actionable mutations,” or mutations in genes for which targeted drugs are already available, both Drs. Shen and Maitra pointed out. However, a small proportion of patients’ tumors had an alteration known as microsatellite instability high (MSI-H), which can cause tumors to develop many genetic mutations. Pembrolizumab (Keytruda) has been approved by the Food and Drug Administration for the treatment of patients with MSI-H tumors, regardless of their cancer type, and Dr. Shen suggested that this treatment option should be considered for people with appendix cancers whose tumors are MSI-H. The study raises other prospects for further investigation. For example, Dr. Shen would like to know whether surgical removal alone is enough to cure appendiceal cancers with GNAS mutations. Dr. Shen also noted that more work is needed to address how best to treat advanced appendix cancers with TP53 mutations, which he said should be studied separately from other tumors. Researchers are beginning to develop cell line models of different appendiceal cancer subtypes based on their molecular profiles, Dr. Shen said, so they can begin testing therapies that might work best against each subtype.